NEW YORK — Allies of Vermont Sen. Bernie Sanders are rallying behind the embattled presidential prospect, even as they reluctantly begin to ponder a painful possibility: a 2020 presidential field without him. 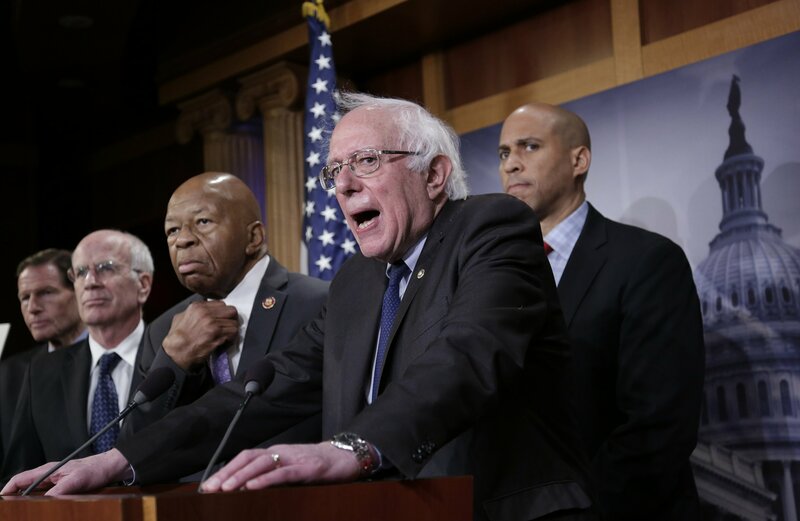 The 77-year-old self-described democratic socialist is the most prominent presidential contender to face a serious setback in the nascent 2020 campaign season. He’s been forced to confront a series of reports detailing allegations of sexual harassment of women by male staffers when he ran for president in 2016. Sanders’ loyalists fully expect him to launch a second campaign in the coming weeks. And his broad network of die-hard supporters is hosting hundreds of events across the nation this weekend encouraging him to run. But the persistent allegations put Sanders in an unenviable political position in the early days of a presidential contest playing out in a #MeToo era that’s offered little mercy for those associated with allegations of sexual harassment. While his Democratic competitors tour crucial states and scope out potential campaign headquarters, Sanders spent Thursday apologizing for the behavior of a handful of his 2016 staffers and looking for a new ones to run his 2020 operation should he enter the race. Some Sanders allies expressed shaken confidence in the political future of the man who has reshaped Democratic politics in recent years and almost single-handed brought liberal priorities like “Medicare for all” and free college education into the party’s mainstream. Politico reported Wednesday that in July 2016, a former senior adviser forcibly kissed a young female staffer after making sexually explicit comments. Sanders’ team said the adviser, who denies the allegation, would not be involved in a second campaign should there be one; and former campaign manager Jeff Weaver, who was aware of some of the incidents, would not serve as campaign manager again. No one has alleged that Sanders had direct knowledge of the incidents. “Obviously, it’s impacted all of us quite a bit. It’s very upsetting,” said Heather Gautney, executive director of Our Revolution, the political arm of Sanders’ network. Despite her concern, Gautney warned Democrats that a 2020 contest without Sanders would inflict serious damage on ambitious plans to shake up health care, education, housing and other liberal priorities. Sanders may not be taken seriously by some in the political establishment, but he would be a force in the 2020 contest should he run. Having nearly beaten Hillary Clinton in the 2016 contest, he boasts an engaged nationwide network, an incredible grassroots fundraising ability, and would almost certainly take some of the very same voters being courted by likely 2020 contenders such as Massachusetts Sen. Elizabeth Warren, New Jersey Sen. Cory Booker and former Texas Congressman Beto O’Rourke. A Sanders spokesman did not immediately respond to questions about Velez’s comments. Earlier in the day, Sanders apologized, as he did last week, for the harm done under his watch and offered a direct message to women affected. “I thank them from the bottom of my heart for speaking out. What they experienced was absolutely unacceptable and certainly not what a progressive campaign — or any campaign — should be about,” Sanders said during an unrelated Capitol Hill press conference, highlighting mandatory training and a third-party hotline instituted during his subsequent Senate re-election to safeguard against further harassment. Sanders’ critics in the Democratic Party — and many remain three years after his heated feud with Clinton — seized on the new revelations as reason to abandon any 2020 plans. Sanders’ vast political network does not agree. Several groups allied with the Vermont senator have ramped up activities in recent days to bolster a likely presidential bid. Our Revolution launched a “Run Bernie Run” online campaign and petition drive on Wednesday while groups like People for Bernie Sanders and Organizing for Bernie plan to host nearly 400 events across the country on Saturday encouraging a second run. Katherine Brezler, co-founder of People for Bernie Sanders, said the allegations of sexual harassment had absolutely no impact on her preference for Sanders. The New York activist said that sexual harassment was present in virtually every one of the 100 or so campaigns she’s worked on.